In the last patch Blizzard added a way to heal your battle-pets. And for me, it’s about time! My battle-pet team has been sitting at 1 HP each since they disabled pet battles. At first when you came out of a pet battle your pets healed up automatically. Then they disabled that and made it so you have to heal them. Except there wasn’t a way to do that yet. Until now. Please note that actual pet battles are still disabled in beta, but this is a sign that they are coming soon. 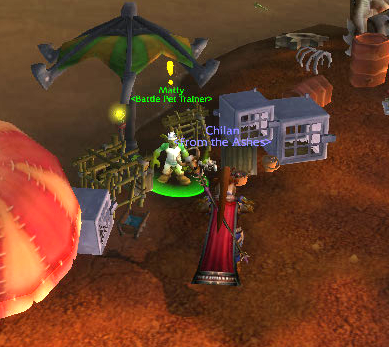 In my case that is Matty the Goblin Battle Pet trainer in the Goblin slums of Orgrimmar. 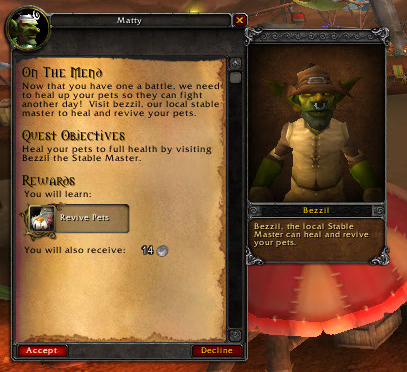 He has a few quests for you if you’ve already picked up Pet Battles from him in the past. 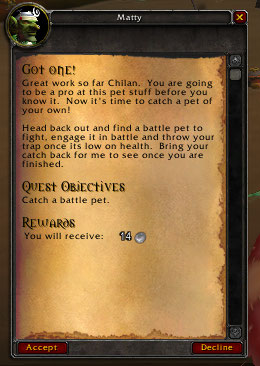 Basically get in a pet battle and win. This should leave some of your battle-pets at less that 100% health. So now you’ll be able to heal them in the second quest. If you’ve already done this you can turn the quest in right away. If not then you’ll have to wait until pet battles are enabled again to do it. Since I had already won a battle I turned it in and picked up the second quest. Head on over to the nearby stable master to get all of your pets healed (Yes, there are lots of typos in that last quest. It happens in Beta.). You’ll be able to heal all of your pets at a stable master whenever you want. Now head back to your battle pet trainer. Turn the quest in and get your Revive Pet spell. Now you can heal your pets. Finally your trainer gives you a third quest. This one is to go out and capture a new battle pet. Again if you’ve already done this you can turn it right back in. If not, you’ll have to wait until they are enabled again. 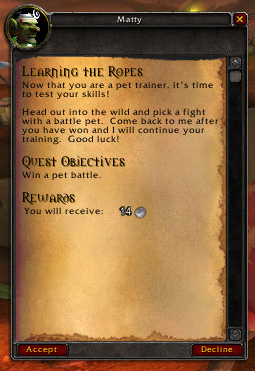 Hopefully this is a sign that the full-fledged version of the Pet Battle System will be live (on beta) soon! What’s With the Flood of Hearthstone Posts?